Few Rap legends seem to have as much to say, especially beyond their lyrics, as KRS-One. However, in recent years, Blastmasta KRS has seemingly stepped away from the media spotlight. Equally, Kris Parker is sparse on social media. Last year he was said to be working with Dr. Dre, following 2017's The World Is MIND album. He recently made an exception for another Hip-Hop artist and activist, Nick Cannon. "The Teacha" spoke to Cannon's Class for nearly two hours. The conversation from early 2019 has just released in full. In one of the rooms at Howard University (where Cannon is enrolled), the Boogie Down Productions co-founder and esteemed MC/producer/author offers some recommended texts. He describes how immature mistakes (including his own) are a necessary pathway to wisdom, and why those critical of the youth must take heed. He also explains how Reverend Dr. Martin Luther King, Jr.'s "I Have A Dream" speech came true in the form of Hip-Hop. 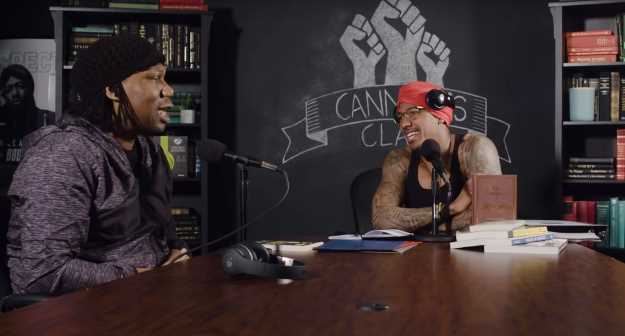 At 26:00, Nick Cannon asks KRS, "In times like the Bilderberg group or Trilateral Commission, these are things we are set up to believe what the novice might call 'something like the Illuminati.'" Cannon points to something Kris said, and refers to these meetings of wealth and power to be arguably delegations on coexistence and unity. Cannon adds that many are taught to fear a singular government or monotheistic society. "But if everybody's at the [same] table, that could be where peace and unity [happens]. So I'm torn when somebody speaks of the Illuminati, or even these real organizations that I just named, are they doing bad or are they doing good?" Kris responds, "Well, when you mention organizations like the Bilderberg group or let's just say 'the banks,'...Bob Marley said something interesting. He said, 'Emancipate yourself from mental slavery, none but ourselves can free our mind / Have no fear for atomic energy, 'cause none of them can stop the time.'" Quoting the "Redemption Song" that Marley wrote in 1979 following his cancer diagnosis, KRS continues, "The prophet spoke. These groups are not above nature, the universe, and God. [Natural disasters show us that] everyday. When we look at these groups, we are looking at what they are advertising themselves to us as. This is a propaganda and perception game. I'm not gonna give away some of the symbols of freemasonry in this public forum [because of] respect to [the secrecy] of the organizations. But I can say this: deception is what rules nations. Go back to the fantasy: you can have whatever you want in the fantasy. But that fantasy is based on deception." Cannon then quotes an adage popularized by film The Usual Suspects: "The devil's greatest trick was proving that he didn't exist." "That's bars," responds KRS, before adding, "Well, these groups are designed to deceive; there's no truth in 'em!" He feels as though these gatherings are a distraction to many, who may blame the 1% for their failures. "You are the master of your reality, if you can understand that. You live in a fantasy, if you can understand that. So then you ask yourself, with all this crime that has been going on, and [also] these societies, none of them is above nature. So as long as you know: God, universe, nature-that's your gun," creating an acronym. "Remember that gun; I'm putting a weapon in your hand. That's the gun you fight back with. When you have that gun in your hand, nothing they say, do, are, be, nothing. Nothing. Now, how do I know this? Hip-Hop." Kris illustrates, "1970s, all these organizations was against us. Every last one-secret societies, societies we knew about, government agencies. The entire strength of this colonial system was against our parents," Kris says of agencies including the FBI, CIA, and branches of government. "The entire government was against our parents that had nothin', except one gun: God, the universe, and nature. They defeated that government. The government you have now exists because our parents destroyed the last one. The enemy is never gonna tell you when they've lost. No, it's up to the winners to say they've won. We won. There was a war that went on from after the Civil War-in fact the Civil War never ended-but right after the Civil War on the battlefield, Reconstruction jumped off-and I wouldn't even call it that. 'Emancipation Procrastination'-I mean 'Proclamation,'" he says, intentionally botching what history texts call a period and Abraham Lincoln's executive order. "Our people are not fighters. Africans, we're the artists, we're the nerds of the world...they're fighting against us just being. Go back to Hip-Hop. They had everybody against us. Martin Luther King said 'I have a dream...'"
Kris believes that King's illustration of integration through his children and white children sitting together took shape in Hip-Hop. "Eminem is gonna be sitting with Dr. Dre. I have a dream that one day 3rd Bass is gonna be doing a concert with De La Soul [or] Beastie Boys and Run-D.M.C. Now, either we gonna look at Dr. King and say, 'That was just a fun speech,' his speech came true, all the way true, and it came true in us. So here you have a man speaking, 1963. He's talking to the nation, to the world. He said, I have a dream of human unity. This is African American enlightenment...now, only a few people supported Dr. King. When he gave the speech, after he gave the speech, and when he died, or was killed. The prophet is never welcomed in his own home. So we look at the words of our prophets: Dr. King, [Marcus] Garvey, Kwame Ture, Malcolm X, Martin R. Delany, and others, we don't heed their message. It's not a criticism of our people; we've been trained to be objective to our education. So even though we learn about our ancestors, we never become them." In this section, Kris goes on to suggest that there is far more financial reward in speaking the fantasy to the masses than the truth. At 45:00, Nick Cannon shifts the discussion to universal law. "I often liken it to the Asian [and] East Asian community, whether it's Hinduism or Buddhism, they seem to operate the concepts [more than Westerners do] of universal law in finding oneness, and to need nothing is what true happiness is." The host believes that frees ourselves, especially in Hip-Hop, from what he calls "the paper chase" and "trying to secure the bag." He continues, "It's more about 'I don't need anything,' and ideas about tangible, material [things, and the realization that] money doesn't make me happy, happy makes me money. Happy gets me those material things. Happy puts me in a place to where I can give to others and do for others, and be more of a light than a sound." KRS responds, "No, you [are] the philosopher; that was heavy right there. You're dabbling with this individuality versus the collective," explains the MC before chronicling some philosophical history between the two schools of thought. At 59:00, Nick mentions B.D.P. 's 1989 Ghetto Music: The Blueprint Of Hip-Hop title, and asks Kris where more such information like this is available. Kris points to his texts. "First, I'm gonna start with my own books-and not arrogantly. What [you and I are] discussing is not in books. You'll get a piece here and a piece there, but this level of discussion [is just that:] a discussion." Near the end of the heavy conversation, Kris reveals he is working on a new book. His titles include 1996's The Science Of Rap, 2003's Ruminations, and 2009's The Gospel Of Hip-Hop: The First Instrument. The most recent is on the table for the Cannon's Class chat. At 1:17:00, Cannon brings the discussion to "the current state of Hip-Hop." He calls Kris a leader and counselor before mentioning that Kris' 1980s Rap class delivered substance. He charges that currently, materialism, capitalism, excess, drug use, and other epidemics permeate the lyrics. Cannon likens it to someone "doodling" over a portrait that KRS and peers created 30 years ago. "They're not doodling; they're adding to the art," responds the guest. "We saw all this coming. Let me take you back: 1973, Kool Herc comes out with his turntable set at a small park called 1520 Sedgwick Avenue in the Bronx. He sets up his thing there. He had done a few parties a few weeks before that. They got so big that he took the party outside. When he came outside, I was living across the street. In 1973 I lived in 1600 Sedgwick Avenue. I came outside, we started seeing block parties-me and my brother, Kenny [Parker]. So when Hip-Hop started, I started. I was a B-boy; I was more of a graffiti writer. This is '73; the Vietnam War had just came to a close, we were still high on Shirley Chisholm, Dr. King's blood was still splattered around, just got over Malcolm X. Medgar Evers [death was in the last decade]." Kris goes on to recall all the government's efforts to hold back Black progress and unity. However, he returns to his "gun" acronym, and asserts that the universe and nature allowed for Hip-Hop. He says that from those Bronx blocks in '73 emerged a pathway to reach the world. In particular, he mentions 1976 and credits Grandmaster Melle Mel and Keith Cowboy of Grandmaster Flash & The Furious Five of teaching all how to rap. Meanwhile, he says that Flash showed a science and technicality through Hip-Hop. Continuing his point, Kris gets to Cannon's illustration of a piece of art handed down through the generations at 1:31:00. Blastmasta says that he recognizes the bitterness from his generational peers. However, he charges that we have given Hip-Hop to "sons and daughters." Likening the passing of the culture to parenting, he says, "Here's what the parent gotta do: change your perception. You don't gotta give up who you are. But if your child sees that as art, see it as art as well. Why? Because we learned this lesson already. Stetsasonic [captured this in] 'Talkin' All That Jazz.' [Daddy-O rapped] 'You said it wasn't art / Now we're gonna rip you apart.' Go back, listen to those lyrics and you will see what we were up against." Kris recalls the gripes surrounding Hip-Hop production and DJ'ing as musicians. "The culture doesn't need us to keep it alive," the guest contends moments later. "Our children are being creative, and they're being creative in the environment in which they're in. If I may be critical for a moment, when KRS-One in the '80s was saying 'You Must Learn,' and we laid out that Blueprint, and we said 'Why Is That?' and we said all of these things, most of the Rap community was against it. The executives of radio [stations] and magazines were against it. They weren't for it. And they weren't for it, not because the message was not true or needed, it was because I appeared to be institutionalizing Hip-Hop by adding rules, by [organizing] the Stop The Violence Movement. That was seen by some as threatening. Because KRS-One is gonna now unite all of Hip-Hop, we all gotta be under him." He continues, "I said, 'Listen. It's not me who needs to lead. I'm more of a priest type; I'd rather make a leader and put that person forward. But I'm willing to lead if no one else is.'" KRS says he pushed for peace, and others followed. At 1:39:00, he says, "Love your children, no matter what. The first rule of parenting is to never let your child's hand go. Your kids are crazy; they're gonna wild out. They're gonna do it, but you have to trust them, and guide them, and look back on when you was the kid that was being told by an elder that what you are doing is not right, not good, not contributing. And maybe it wasn't at the time. But you know you grew up; I know I grew up." KRS applies the wisdom to his career. "I look back on myself...man, I talk to Roxanne Shante sometimes; I can't even look her in the face." On B.D.P. 's "Bridge Is Over," Kris made sexist remarks about the Juice Crew opponent. "What was I thinkin'? But I was young. I'm quite sure anybody [can relate]. My record is open for all to see; I'm not proud about a lot of things that I did in the past. But this is what wisdom is. You don't get wisdom being good. You gotta sink to some low places; you gotta talk to some criminals. You got to have a life in order to gain wisdom! Love is the law that binds everybody, binds the universe. It binds our culture. It can bind Hip-Hop and African American culture, 'cause I believe that Hip-Hop is African American enlightenment...it defeated the government of the '70s, the '80s, and the '90s, and it's still goin' strong right now." In the closing minutes, Kris reminds Nick Cannon that masterpieces can never be destroyed. Landmarks with bullet holes keep them for provenance and canvases can be sewn back together. "Yeah, they tore the culture up, from 2000 to now. But guess what's gonna happen in 2020? These same kids are gonna rise like we did, and they gonna look and they gonna say, 'When we was stupid, what did you say as an elder? Did you love us? Did you care for us? Did you look at us, or were you just pointing the finger?' So when we look back, you can rest assure that KRS-One-and there's a couple of others as well-I'm a hard critic of everyone in Hip-Hop. But in that criticism, the freedom for all of us to be who we are is what made Hip-Hop what it is! It is our freedom. Do, say, or be whatever you think is possible. This culture can hold you. This culture can handle you." In addition to overseas touring, KRS-One reveals that he is working on a documentary about Boogie Down Productions' debut album, Criminal Minded.